We ensure every job is completed promptly, efficiently, and delivered with courtesy. As a safety-first company, we always go the extra mile—by pre-screening our team members through background checks, drug testing, clean DMV, and aptitude qualifications test, we have built a team that is reliable, hard-working, and always gets the job done right. Our mission is simple—we exist to provide the highest quality electrical repairs and service at a fair price. From outdoor security lighting to home generators that keep your appliances working during a power outage, our team of electricians can install exactly what you need, promptly and safely. When it comes to electrical repairs, our highly-trained techs can handle just about anything from generator repairs and installs, panel upgrades & rewires, all types of lighting, outlets, and GFI outlet repairs. We also provide alarm installations, surge protection and smart home design. Get started today with a free estimate! 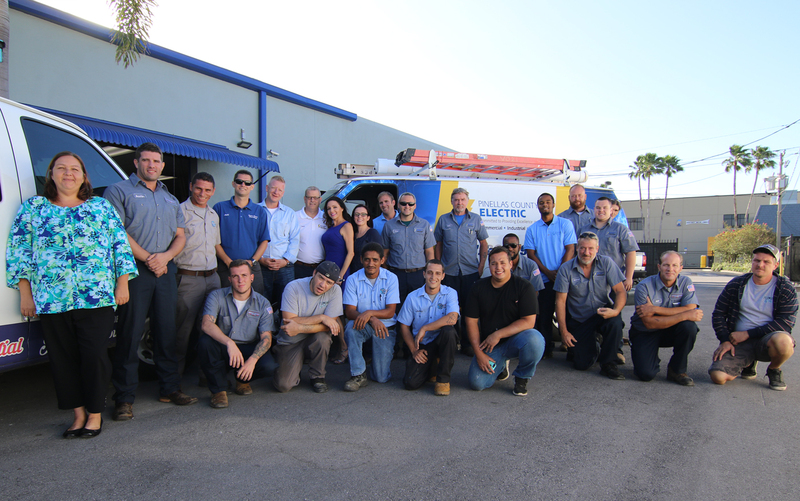 We are a family owned and operated Residential and Commercial Electrical Repair and Service Contractor, proudly serving all of Pinellas County and much of the Tampa Bay region. Educated: We believe that continuing education is and always will be of utmost importance in the electrical trade. To keep up with new technology, methods, and industry changes, we carve out an hour every Monday morning to teach, listen, and learn about industry news and updates. This time together helps us grow as a team, molds us together, and helps us carry about the best possible service for our clients. Secure: With a fleet of fully-stocked service vans, we are equipped with everything needed for both typical service calls and emergency repairs. Because our materials are scanned on and off, our clients can receive an itemized bill to see exactly what their dollars are covering. Ethical: With over 150 years of combined experience on our team, accredited partnerships on our leadership team, and some of the most well-trained tradesman in the industry, we work with the utmost respect, integrity, and transparency for every home and workplace we serve. Protective: Looking out for our customers is our first priority—if you don’t feel comfortable with a certain electrician working in your home or office space, neither do we. Reliable: For those who wish to take advantage of lower rates, we offer financing plans. As a company that values checks and boundaries, we don’t believe in one-day hires. Instead, we’ve earned our Google Certified Contractor title and Independent Electrical Contractors partnership by hiring with integrity and a thorough interview process. Why Choose Pinellas County Electric? » Fully Licensed & Insured – Pinellas County Electric is fully licensed and insured. We operate under the FL State License: EC13004964. » Guaranteed Work – All labor and supplies that PCE provides and comes with a 1 year warranty under normal use. In this rare event, PCE will either repair or replace the item at no charge to you. So need to worry, your in good hands! » Free Estimates – Have a project your thinking about doing or other items your looking to replace as routine maintenance? Let our team who brings over 60 years of experience to your home or business and see how we can save you time and money. » In-House Financing – We understand life doesn’t always go the way we plan, so we figured out a way to help with our new low rate financing to help you tackle that unexpected electrical project. Let our estimator know and we will provide you with all the information needed to get started. » Professionalism – We provide flexible scheduling to accommodate the needs of our clients. We are very prompt in addressing customers needs and concerns. Our qualified team members will give a 30 minute courtesy call prior to arrival. We respect your time! » Our Electricians – We take safety very seriously. All of our technicians receive several tests to ensure competency. Our team members have mandatory weekly safety meetings. We strive to offer the best quality service and we believe it starts with hiring the most qualified electricians. » Prevention Is Key – We offer service plans that save you time and money in order to protect your home or business. We have fully equipped service trucks. Our trucks are stocked with most of todays standard electrical equipment, also having the best tools so we can do the job as efficently as possible. If it is a specialty item, no worries, supply houses are typically around the corner. » Testing and Locating – We use “top-of-the-line” tools and equipment to ensure quality work in a timely manner. The right tool for the job means more precise troubleshooting and professional installs. » Brand Recognition – Between Honeywell, Generac, IEC, and Lutron Caseta, we’re industry-recognized and known for keeping our clients safe and happy.